Brisbane tourism attractions are great. Brisbane is the third largest city in Australia, but it is certainly friendlier and more laid-back than Sydney and Melbourne. It's known for its Story Bridge, but there are also the Roma Street Parklands and Brisbane museums, Bretts Wharf and Newstead House, Mount Cootha, and some great islands like Moreton Island and North Stradbroke. North of Brisbane is the Sunshine Coast and south is Gold Coast. Here is some Brisbane travel information, and in the end of this page is a map of Brisbane. Brisbane Story Bridge. Poster by AllPosters. Click on thumbnail to buy. Although Brisbane’s suburbs cover large areas, Brisbane city center is pretty compact. A few blocks from the central station, Roma Street Station is the King George Square and the beautiful City Hall. Inside is the free Brisbane City Gallery on the ground floor; and upstairs there is an observation deck with some good views over the city. Central Brisbane. Poster by AllPosters. Click on thumbnail to buy. The City Hall and a few other older buildings stand right among the modern skyscrapers in the Brisbane city center. One block south-east of the City Hall and King George Square is the central shopping mall – Queen Street Mall, with shops and arcades, and some very nice outdoors restaurants and bars. In the eastern end of Queen Street is the Eagle Street Pier with the Riverside Centre and Customs House. Eagle Street Pier is a lively dining area and the Riverside Centre gets even livelier during the Sunday Riverside Markets. Customs House used to be where the ships had to pay tax, now it is a nice historical building with a free Art Gallery on the lower floor, and a good Brasserie. Eagle St Pier. Poster by AllPosters. Click on thumbnail to buy. South of here is the Brisbane Botanical Gardens, a lovely green park with lots of grasslands and impressive trees like Moreton Bay Figs. It is a great place to walk or jog, or have a picnic. West of the Brisbane Botanical Gardens is the Queensland University of Technology where there are a Gardens Theatre and the QUT Art Museum. Between the two is the Old Government House, and north of it is the new Queensland Parliament House, where there is a public balcony where you can watch politicians in action. From here, you can walk back to the southern end of Queen Street Mall, where there is the Brisbane Casino, in a beautiful Renaissance style building. It is open 24 hours a day and is packed with poky machines, roulettes, and gaming tables so you can loose your money in a variety of ways. There are bars and eateries inside so you don’t even have to go out to the real world to have a meal, and there is a hotel so you can stay here too. South of the casino is Victoria Bridge which takes you to the South Bank. Casino. Poster by AllPosters. Click on thumbnail to buy. In the South Bank Parklands, there are South Bank Parklands - an impressive landscaped leisure area with walking tracks, cafes and restaurants, and the only sandy Brisbane beach, but a very enjoyable one. Further south is a Nepali Pagoda, the IMAX Theatre, and the Stanley Street Plaza, where there are Weekend Markets selling arts, crafts and clothing. On South Bank Piazza there is an Outdoor Cinema on Saturday nights between October and March. South Bank Parklands. Poster by AllPosters. Click on thumbnail to buy. South Bank is also the place to go if you like Brisbane museums – the Queensland Cultural Centre contains the Queensland Museum with exhibitions about the history of Queensland, a large skeleton of a dinosaur found in inland Queensland, and other displays related to Queensland. The Queensland Art Gallery has displays and artworks of many Australian artists. In the complex, there is also the Queensland State Library, Performing Arts Centre, Queensland Conservatorium and Convention and Exhibition Centre. In the south-eastern end of the South Bank is the interesting Maritime Museum. Victoria Bridge. Poster by AllPosters. Click on thumbnail to buy. If that is not enough Brisbane museums, back on the North Bank there is the QUT Museum of Art. Talking art, around the Institute of Modern Art in Brisbane Fortitude Valley, there are the Craft on Brunswick, Jan Murphy Gallery and Philip Bacon Gallery. South of the city centre there is the Hart’s Flying Fighter Museum with a collection of fighter planes, and the Charles Kingsford Smith Memorial. North of the city centre is the Newstead House – a historic Victorian-style homestead from 1846 with antique furniture. Kangaroo Point. Poster by AllPosters. Click on thumbnail to buy. West from the Brisbane city centre there are nice walkways along the river that you can also cycle on your way to the western suburbs such as Milton with some nice restaurants along Park Road, and the Castlemaine Perkins XXXX Brewery where you can go sampling the famous Fourex beer. North-east from here is Paddington with Caxton Street, known for its pubs, restaurants and night-life; and east of it is the Petrie Terrace with the beautiful Roma Street Parklands. Across the river is the bohemian West End, a colourful suburb with hippie shops and lovely cafes and restaurants along Boundary Street and Hardgrave Road. Further south-west is the University of Queensland where you can visit the Anthropology, Geology and Zoology museums by appointment. You can get to the UQ by Brisbane City Cat from Victoria Bridge. Brisbane tourism. Poster by AllPosters. Click on thumbnail to buy. East of Victoria Bridge, the City Cat has several stops to the different suburbs along the Brisbane River. You can get off at the South Bank Parklands, Eagle Street Pier, next to Story Bridge Brisbane where there is a nice hotel to have a few beers with views. Further City Cat stops are Dockside on the eastern side of Kangaroo Point Brisbane, New Farm, Newstead House, the famous Breakfast Creek Hotel and Bretts Wharf. Kangaroo Point is popular with rock climbers but there is also a lovely walk along the river. South of Kangaroo Point is Brisbane Cricket Ground The Gabba. North-east of Kangaroo Point are New Farm and Brisbane Fortitude Valley. Both got changed from sleepy suburbs only a decade ago and today their streets are lined with nice wine bars and restaurants. In the southern tip of New Farm is a lovely park with picnic tables and barbeques, Brisbane Powerhouse Museum, and the Summerhouse – a nice restaurant. North from here the Brunswick Street with many hotels and backpacker hostels takes you to Brisbane Fortitude Valley with Brisbane’s Chinatown, the Brunswick Street Mall, and on Saturday mornings, McWhirter’s Markets. North from here are the City Cat stops to Newstead House, and the famous Breakfast Creek Hotel that I warmly recommend for a cold beer. Brisbane tourism. City Cat. Poster by AllPosters. Click on thumbnail to buy. West of the city centre is Mount Cootha – a bush parkland with Brisbane Botanic Gardens (not to be confused with City Botanic Gardens) a Summit Restaurant and a lookout platform where there are good views of Brisbane city centre. Near the lookout is the J C Slaughter Falls, and a short Aboriginal Art Trail. In the outer Brisbane Botanic Gardens there are free guided walks amongst the 20,000 species of both arid and rainforest plants and there is also the Sir Thomas Brisbane Planetarium – the largest planetarium in Australia. Lone Pine. Poster by AllPosters. Click on thumbnail to buy. South of Brisbane Botanic Gardens is the Lone Pine Koala Sanctuary with its 130 koalas, but also other Australian animals such as kangaroos, wombats, echidnas and platypus. You can buy a bag of kangaroo food and get really close to them, and you can get your photo taken with a koala. Central Queen St Mall. Poster by AllPosters. Click on thumbnail to buy. * hotels such as Base Embassy Hotel, Carindale Hotel, Chesters Hotel, Chifley at Lennons Hotel, Colmslie Hotel, Diana Plaza Hotel, Emporium Hotel, George Williams Hotel, Grand Chancellor Hotel, Hilton Hotel, Hotel Chino, Ibis Hotel, Il Mondo Hotel, Mantra South Bank Hotel, Medina Executive Hotel, Mercure Hotel, Oaks Aurora Hotel, Oaks Charlotte Towers Hotel, Oaks Felix Hotel, Park Regis North Quay Hotel, Rendezvous Hotel, Royal Albert Hotel, Royal on the Park Hotel, Sebel King George Square Hotel, The Marque Hotel, The Point Hotel, The Waterloo Bay Hotel, Treasury Casino Hotel, Urban Hotel and Watermark Hotel. * motels such as Airolodge International Motel, Airport Clayfield Motel, Airport Inn, Airport Motel, Airway Motel, Ambassador Motor Inn, Annerley Motor Inn, Aspley Motor Inn, Best Western Airport 85 Motel, Best Western Airport Hacienda Motel, Best Western Astor Metropole, Best Western Gregory Terrace, Best Western Sunnybank Star, Brisbane International Rocklea Motel, Camelot Inn, Chermside Court Motel, City Palms Motel, Comfort Inn Suites Northgate Airport, Comfort Inn Suites Robertson Gardens, Comfort Inn Airport Admiralty, Edmondstone Motel, Explorers Inn, Formule 1 Windsor, Formule 1 Airport, Hamilton Motor Inn, Kingsford Smith Motel, Manly Marina Cove Motel, Metropolitan Motor Inn, Novena Palms Motel, Quality Inn Airport Heritage, Quay West Suites, Queensland Motel, Soho Motel, Southern Cross Motel and Apartments and Spring Hill Terraces Motel. * resorts such as Nestle Inn Tourist Village, Q Resorts Abbey Apartments, Q Resorts Tribeca Apartments, and Sapphire Resort. * bed and breakfast accommodation such as Carinya Highgate Hill B&B and Kirkland House B&B. Kangaroo Point Holiday Apartments, Kirribilli Riverfront Apartments, Meriton Serviced Apartments, Oaks Casino Towers Apartments, Parkview Apartments, Quest Bridgewater Apartments, Quest on Story Bridge Apartments, Skyline Apartments, The Dock on Goondwin Apartments and The Sedgebrook on Leichhardt Apartments. * backpacker hostels and lodges such as Base Central, Bunk Backpacker Hostel, Econo Lodge City Star, Homely Houses Cairns Street, Leatherwood Lodge, Minto Student House, Prince Consort Back Packers, and Tinbilly Travellers Hostel. * caravan parks and cabins such as Brisbane Northside Caravan Village and Brisbane Holiday Village. Some areas with good pubs and restaurants are New Farm, Fortitude Valley, South Bank and Caxton Street. If you like touring, there are organised tours offered by City Sights Bus Tour (a very handy hop-on-hop-off sightseeing trip that takes you between Brisbane's attractions), City Lights Tour, Brisbackpacker Tours and River City Cruises which take you around in the city. Brisbane Day Tours takes you to whale watching between June and November; and Araucaria Ecotours and Allstate Scenic Tours take you to the surrounding national parks. If you want to rent a car or campervan to get around on your own, a handy site to compare different companies such as Avis, Budget, Europcar, Hertz and Thrifty, and book them for no additional cost is Discovery Carhire. Brisbane’s outer suburbs that cover large areas are not boring at all. Just south of the city centre is Manly with the second largest marina in the southern hemisphere after Fremantle in Western Australia. There are once-weekly yacht races; and Solo, Manly Eco Cruises and Bay Dolphin Sailing Tours will take you for a ride. You can stay at Manly Hotel or Moreton Bay Lodge. From Manly, you can reach St Helena Island National Park where you can discover the ruins of an old prison with AB Sea Cruises. South of Manly is Cleveland, a nice seaside suburb with access to North Stradbroke Island. The southern half of the “Straddie” island is used for sand mining but the northern side is accessible. Fast Cat Service (run by Stradbroke Flyer) takes you to One Mile Jetty, while Stradbroke Ferries and vehicle ferries take you to the town of Dunwich, where there is the North Stradbroke Historical Museum. From here, there is bus service to the northern towns Amity Point and Point Lookout, where there are some lovely beaches and walking tracks with views over the ocean. With a 4WD you can reach the Blue Lake and the Brown Lake, or drive all the way along the island’s eastern coast down to Jumpinpin. You can hire gear for watersports from Stradbroke Island Guesthouse and Straddie Adventures; go diving with Stradbroke Island Scuba Centre; or touring with Stradbroke Island Tours. There are a few cheap camping sites in the bush, or you can stay at Stradbroke Island Beach Hotel, Stradbroke Island Guesthouse or Stradbroke Island Tourist Park. North of Brisbane city centre are the beautiful suburbs Sandgate, Brighton, Margate and Redcliff, where I have always seen dolphins swimming from the beaches. North from Redcliffe is Scarborough where vehicle ferries leave for Moreton Island, and take you to the island’s northernmost township Bulwer, around which are many 4WD and walking tracks (there are no paved roads or bus service on the island) and camping sites at Blue Lagoon and Eagers Creek on the east coast of the island. Further south are Cowan Cowan (another township), the 280m Mt Tempest (worth hiking), and Tangalooma. Tangalooma Wild Dolphin Resort runs boat service to mainland from a dock north of Wynnum off Kingsford Smith Drive. Off the coast of Tangalooma there are the Tangalooma Wrecks but the resort is most famous for its wild dolphin feeding similar to this in Monkey Mia in Shark Bay in Western Australia. The resort is also the only place to stay on the island unless you camp in the bush. Inland from Brisbane is Darling Downs, - an area of rolling hills of agricultural land, historical towns and the only grape-wine region in Queensland. 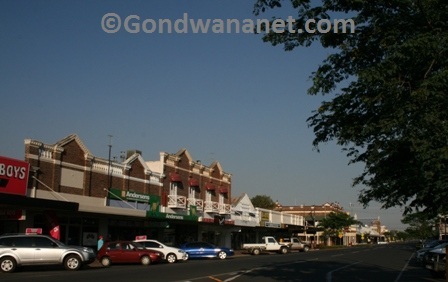 The first town west of Brisbane is Ipswich, where there are some nice old buildings, the Global Arts Link, and the nearby Main Range National Park. Places to stay in Ipswich include Best Western Heritage Motor Inn, Country Comfort Hotel, Metro Hotel International, Niche Small Luxury Hotel, Oaks Aspire Apartments, and Quest Hotel Apartments. South-east from Ipswich is Warwick, another historic town known for its Rodeo in the end of October but there is also the Pringle Cottage and Museum worth having a look. There are many places to stay in town but recommended is the Talgai Homestead 40km north-west of Warwick. Places to stay in Warwick include Abbey of the Roses Guesthouse, Cherrabah Homestead Resort, Coachmans Inn Hotel, Comfort Inn, Country Rose Motel, Golden Harvest Hotel, and McNevin's Gunyah Motel. Near the border of NSW is Stanthorpe – the gateway to Sundown and Girraween National Parks. In town, there are the Stanthorpe Heritage Museum and the Stanthorpe Regional Art Gallery. Places to stay in Stanthorpe include 31 The Rocks Hotel, Alure Villas, Apple Blossom Cottage, Granite Court Motel, Happy Valley Retreat Hotel, High Street Motor Inn, Honeysuckle Cottages B&B, Murray Gardens Motel Cottages, Olive Grove Estate Apartments, and Sommerville Valley Tourist Park and Resort. South of Stanthorpe is the Granite Belt – Queensland’s only wine district in an area cool enough for grapes to grow (the wineries of northern Queensland grow tropical fruit wines instead). The wineries in the Granite Belt include Mountview, Bungawarra, Ballandean Estate, Felsberg Winery, Bald Mountain Winery, Kominos Wines and Rumbalara Vineyards. You can stay at Vineyard Cottages & Cafe, and tour the area with Filippo’s Tours or Granite Highlands Maxi Tours. North from Stanthorpe and Warwick is Toowoomba – the largest town in the area with Toowoomba’s Botanic Gardens, Cobb & Co Museum, and plenty of places to stay. Places to stay in Toowoomba include Allan Cunningham Motel, Best Western Ambassador on Ruthven Motor Inn, Best Western Applegum Inn, Best Western Tuscany on Tor Inn, Blue Violet Motor Inn, Bridge Street Motor Inn, Burke and Wills Hotel, Central Plaza Apartments, City Motor Inn, Clifford Park Holiday Motor Inn, Comfort Inn Glenfield, Downs Motel, Eastgate Motel on the Range, Garden City Motel, Grammar View Motel, Great Divide Motor Inn, James Street Motor Inn, Leichhardt Motor Inn, Riviera on Ruthven Motel, Sunray Motor Inn, The Coachman Motel, The Shamrock Hotel Motel, Toowoomba Motel, Tudor Lodge Motel, and Vacy Hall Historic Guesthouse. Inland from Toowoomba on the way to Miles there is the turnoff to Bunya Mountains National Park; and Jondaryan Woolshed Complex where the famous shearers’ strike started in 1890 which lead to formation of the Australian Labour Party. 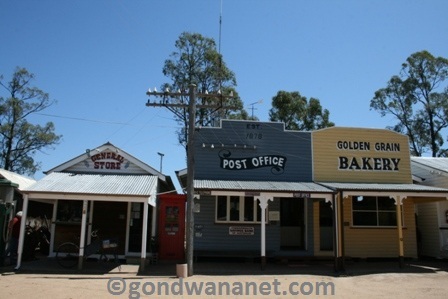 Today it is an excellent tourist complex with old buildings, shearers gear and even a dining shelter and accommodation. In Miles, there is the interesting Miles Historical Village. One of the places to stay is Starline Motor Inn. West from Miles is Roma, a town worth visiting during the Easter weekend when there are rodeo, markets, horse races and country music happening in the Eastern in the Country Festival. There is also the Big Rig Complex interesting with a museum of oil and gas exploration. North of Roma is the Carnarvon National Park – one of the best national parks in Australia. Places to stay in Roma include Best Western Bungil Creek Motel, Motel Carnarvon, Quality Inn Overlander Homestead, Roma Explorers Inn, and Starlight Motor Inn. Here's a map of Brisbane, where I have tagged the places that I mentioned on this web page. You can click on the tags to see what places they are, and double-click anywhere on the map to zoom it in and see the places closer. Drag the map to move around, and if you want to see the satellite image with Google Earth, click on "Sat" in the top right hand corner.